God's Best Gift: Something wonderful is about to happen! Today is husband's last day at work. I wanted to put in record so I won't forget. Tomorrow he'll start anew. A life without a bundy clock. To say that I am jealous is understatement because I have been dreaming of that 10 years ago. I hope it will be my turn someday soon. Hubby will be working for us full time now, he will be his own boss! how cool is that? He'll be a full time uber driver of his own car. Yesterday, we got our DTI registration (Slingshot transport services is the name!) and next week he'll be applying for the Mayor's permit. Small step to the fulfillment of our dreams. 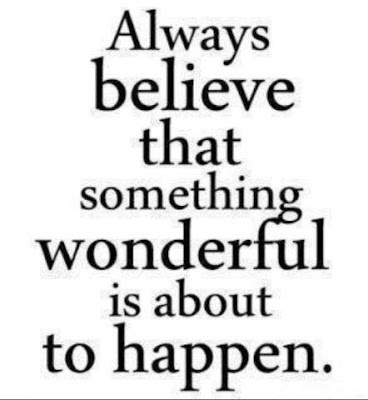 I know and I believe SOMETHING WONDERFUL IS ABOUT TO HAPPEN. How wonderful. He's be so happy to not have to punch a clock. He can work when he wants. Love this.